Kubernetes is fast maturing as an open source container orchestrator for automating deployment, scaling, and operating complex containerized applications. Containerizing the OpenStack control plane and running on top of Kubernetes (which acts as an underlay) makes OpenStack easier to scale, upgrade, and manage. Just as Kubernetes and containerization bring benefit to rapid application development and delivery, bringing OpenStack and Kubernetes together can increase the resilience and scale of the OpenStack control plane and enable faster delivery of infrastructure innovation. 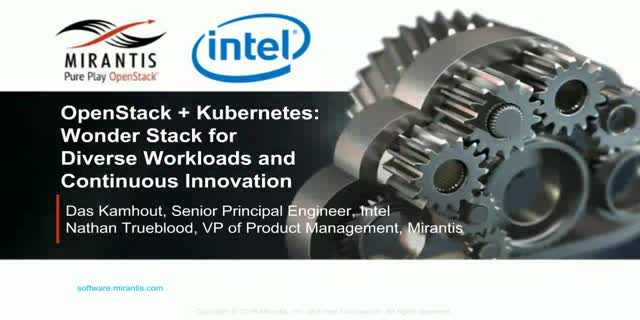 Join Mirantis' Nathan Trueblood and Intel's Das Kamhout to learn about how you can benefit from the work the OpenStack and Kubernetes communities are doing to provide a single platform for running bare metal, VMs and container workloads so that companies can rapidly deliver applications and business value to their customers.